Narita airport is one of the two primary airports that is access to Tokyo and Yokohama area. To Yokohama Station by Narita Express — approx. 100min. To Yokohama City Air Terminal (Y-CAT) by BUS — approx. 90min. In 2010, a dedicated international airport was opened at Haneda Airport which is connected to almost all domestic flights to and from Tokyo. To Yokohama Station by Keikyu Line Airport Express — approx. 28min. To Yokohama City Air terminal (Y-CAT) by BUS — approx. 30min. *Y-Cat is 3min. walk from East Exit of Yokohama Station. You can get more information from japan-guide.com, Yokohama Visitors Guide and JR-East website, English information Services. You can search how to get there with the Google map above. Nihon-odori Station is the underground of Yokohama Joho Bunka Center. The subway exit “No.3” is directly connected to the building of the site. Nihon-odori station is the 4th station after you leave Yokohama Station. Make sure to board limited commuter express or express trains, or local trains. Please note that “limited express trains” will NOT STOP at Nihon-odori station. 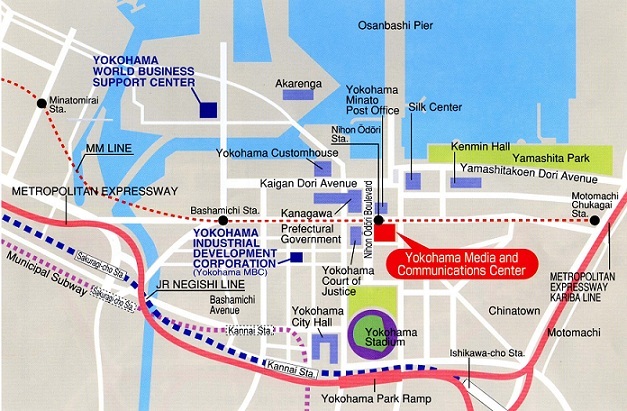 Yokohama Joho Bunka Center is located in Kan-nai/Yamashita Area of Yokohama. Please visit the following website to get more information. You can stay at Hotel Monterey Yokohama and Hotel New Grand. Both hotels are about 8min. walk from the symposium site, 3min. from Motomachi-Chukagai Station, and 1min. from the sea. We offer special rates of Hotel Monterey Yokohama and Hotel New Grand for Coolchips participants. If you are interested in special rates for COOLChips participants, please check the following Reservation Form.